Lot Size: 30,OOO sq. ft. Right at the shore, amidst a green palm garden, a stone’s throw from the Stella Maris Resort Club and its Moonshine Pub & Beach, in the heart of Stella Maris Village. Some 1,800 sq. ft., small kitchen and utility, nice threw-breeze living room, three bedrooms/two bathrooms; two-space garage; east-facing porch. 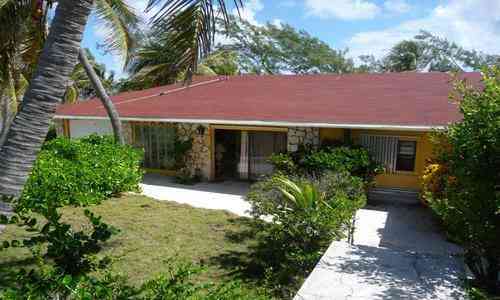 Originally built in the seventies, owner improved/partially renovated until recently. Now suggesting uplifting IN and OUT, without major works being needed. Bungalow is furnished and is still readily usable as is. Connected to the Island’s BEC electricity services. Water supply = by own rainwater collection tank system. All Legal Fees and Government Stamp Taxes to be evenly shared between Vendor and Purchaser.